The Boker Folding Hunter is a fantastic addition to any stag collector's arsenal. This lockback knife features classic nickel silver bolsters, brass liners, and a 440C stainless steel drop point blade. 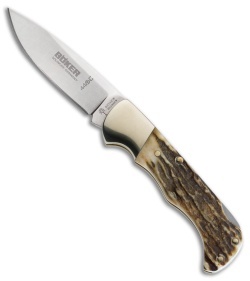 Includes a genuine leather sheath for secure storage and carry.